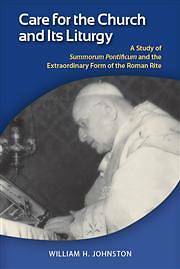 In July 2007, Pope Benedict XVI issued Summorum Pontificum, designating two "uses" or "forms" of the Roman Rite, declaring the Missal of Paul VI to be the "ordinary form" and the 1962 Missal of John XXIII to be its "extraordinary form." On the same day, the pope also published a letter to bishops, Con Grande Fiducia, to accompany and offer commentary on this motu proprio.In Care for the Church and Its Liturgy, William H. Johnston offers analysis and commentary on both documents, exploring their meaning, context, purposes, implementation, and implications. Johnston carefully attends to the multiple purposes of the documents themselves and to the various questions related to their implementation, as well as to the complex postconciliar dynamics in the Catholic Church. His approach throughout is appreciative, critical, and constructive. Johnston s study embodies respect for dialogue, unity, and charity. It will provide much food for thought and discussion among both academics and pastoral leaders in the years ahead as the church discerns its liturgical way forward, and all those with educational or pastoral responsibility for the liturgy will find it an informative resource and valuable guide for understanding and assessing this still constitutive feature of the Roman Rite.